I had some time last night to finish some of my early spring cleaning – emptying out a bunch of boxes from when I had renovated, mostly, and tossing all sorts of old papers, faded magazines and the other junk you collect for no real reason, it just sort of collects. Now, I’m not a pack rat. I have a kind of Zen feeling to my house but there were a few things I simply stored away to sort another day. These included old boxes from when I was taking care of an adult baby, which goes back a few years now from before I moved. Last week, I was surprised to find how many diapers I still had (I’m guessing at least a few hundred). This week, I was surprised to find I still had a fair number of clothing items. But it had me wondering about how adult babies respond and feel about wearing toddler or baby-like clothing. Maybe there would be a few things that would suit anyone – but don’t tastes in clothing vary from person to person just like for adults? Or does it matter to an AB? Is being babyish enough? When I see an adult baby, I don’t just see the physical person the rest of the world sees, I also see a little boy. It’s a very odd thing to try to describe and I find it happens to me in everyday life as well. Have you ever noticed a 60-year old who seems to glimmer and radiate a sort of youthful energy? Or a man who pouts like a teenager? That’s similar to the feeling I get when I look into the eyes of an AB: I see both their physical self, and I see a little boy sort of ‘layered’ into their personality. Maybe I see a shy little guy who needs cuddles and attention to draw him out. Or maybe I see a mischievous grin and notice the toddler within who likes to explore and play. So it seems to me, first, that helping to make that little guy inside shine and feel free to express himself has a lot to do with understanding his personality, his inner age. This ‘age’ can vary, by the way, which is one of the many wonders and joys of caring for a boy. Some days he’s more “grown up” and wears street clothes that might be suitable for a young teen or tween (although with a paci in the pocket and a diaper underneath his jeans). I have brightly colored shirts, some of them with cartoon or comic heroes for just these occasions. I also have training pants and plastic pants for these little guys as well. Sometimes diapers aren’t practical, but the thickness of a training pant or the discrete and secure feeling of a plastic pant can go a long way. Some nights he’s more babyish and needs a romper, sleeper, bottle feeding and an early night in his crib. Another aspect of AB clothing is related to the sensory experiences of being an AB. I would LOVE to see a study on this one day, because I really feel as if ABs are more in touch with all their senses than many of us: they’re very aware of smell, taste, touch and sound. Clothing that is soft, fleecy, smooth, and blanket-like goes a long way to making an AB feel comfortable, cozy and cared for. As a daddy, I really love shortalls. For some reason the bib and shoulder straps make me feel like my son is snug and secure. I wonder whether ABs feel the same way, however, but for me the little snaps at the shoulder are a gesture of care. Rompers, shorts or other clothes with an extra inner plastic layer or sewn-in plastic pants are an amazing way to make a little guy feel like he has extra protection. I have several play suits and rompers with plastic lining which makes a nice rustling, crinkly sound and which add extra protection against leaks. In a similar vein, and it almost goes without saying, onesies are essential so a little one can feel that his diaper is nice and snug. Making sure a boy feels that his diaper is secure is soooo critical I can hardly put it in words: knowing that he will slowly lose his worries about using his diaper is a deeply powerful feeling to a dad. I suppose it’s just a dream, but I’d really love to have a home which was a safe base for both the more adult things that a son chose to pursue, like friends and school and work, and for the expression of the little boy that doesn’t get turned on or off, but is just part of the texture of who he is. In this dream, the baby and toddler clothes aren’t stored off in some secret place somewhere, but are part of his full wardrobe. Everything is one continuum, one expression of who he is as a person. Now, I realize that there may be times to be “totally adult” and that’s fine. But I can’t help wondering whether a little guy might prefer to open the drawers and not find any “normal” underwear – maybe there’s cartoon undies or training pants, but there are larger stacks of Pull-Ups, Goodnites, and, of course, diapers. When he looks on the shelf, he doesn’t see many muscle shirts or plain white t-shirts, he sees striped shirts, cartoon characters, and T’s that come down just above the waist of his diaper. There aren’t any tight jeans, but there are slightly baggy cargo pants or jeans with a little Elmo patch on the back pocket. Looking across the range of his wardrobe, he sees plain onesies that he can easily wear to school, and he sees onesies with ducks on them in pastel shades. He sees shortalls and overalls and notices the snaps in the legs. He sees play suits, rompers, sailor suits, and plastic-lined shorts that make him giggle when he wears them because of how they puff out over his diaper. He sees diaper covers and plastic pants, sleepers and little kid PJs, soft little booties and sneakers with velcro straps. For a daddy, looking in my little guy’s dresser or closet and seeing all of that would remind me that the boy who can express himself in so many amazing ways has given me a great gift. But I wonder how you feel? Are there certain specific things you need to see when you open that door? Certain colors or styles or items that would make you feel closer to who you are? And something that I often wonder about – what level of choice do you like to have in shaping your expression as an adult baby? Do you like to sit down with a dad and look at photos and point to things you like? Do you prefer it when a daddy gives you a few options to choose from? Or do you prefer to choose yourself? 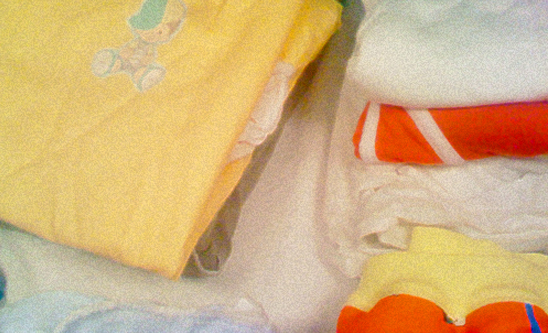 For me, type of baby clothes isn’t very important. Being babyish is ussully enough, and when it comes to picking new ones, Daddy giving a selection of his favourites makes me happier. What style I feel best fits me isn’t as important as how Daddy perceives me. If some clothes made Daddy happier over others, I would always want to pick them. Because It’s a lot easier to feel cute and adorable in baby clothes when you know your wearing the person who looks after you’s favourite. i agree with Ducky again. its what “daddy” thinks is cute on me that would be important. maybe its from seeing ppl smiling and saying how cute u looked when u were little that makes u want to wear the same clothes again so u can get those same feelings again. when i got to the first foster home i lived in, there was another boy there that had like tons of cute baby clothes that got handed down to me. i was older than him, but he was bigger, so i got his clothes when he got too big for them. when ppl would smile and told me how cute i looked it made me want to get that like all the time. 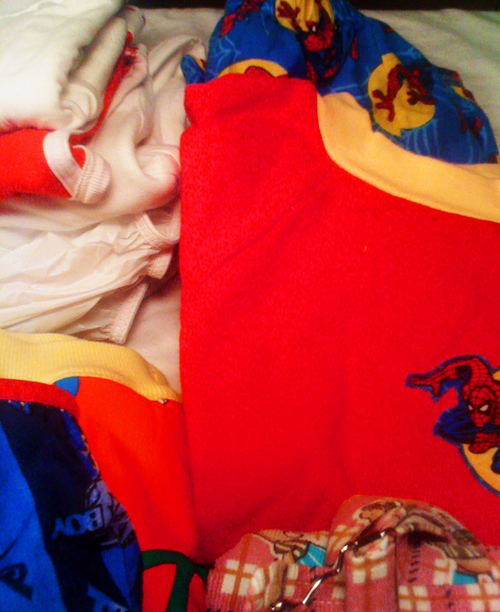 so maybe thats why i love toddler clothes, not baby clothes. i dont remember being like an infant baby, but since i got to be a toddler long enough to remember that, its what i still wish i could be. every time i see little boys in cute clothes i wish it was still me in them. its totally cool u still have those kinds of clothes for “big” little boys. I am kind of lucky, I get to wear my little boys clothes alot and do have snaps in the majority of my pants and shorts. Its been many a time when i am out in snap pants and something changes and i have to go meet a client and I am still wearing my snap jeans. My big boy clothes and little boy clothes are all mixed together in my room, and the diapers and change table are all out in the open. I do like when my clothes are picked out for me, as most of us toddlers are to good at doing that, though I will grab at anything with Elmo on it. I would love to know who made that Elmo onsie of FaceBook. as always, i really really really appreciate reading daddy josh’s blog and seeing how he things about us ab boys. my adult, big boy and baby boy clothes are kinda integrated like daddy was talking about. its kinda fun opening my closet door and seeing my baby blue footed sleeper and my ducky footed sleeper next to my big boy shirts or pants. Or opening a drawer to find training pants and cartoon underpants next to my big boy underpants and diapers. it is like the integration of the clothes helps me be more integrated as a person. 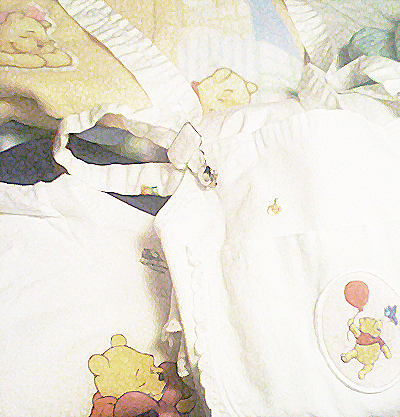 i do wish i had more baby clothes though…a few more onesies or a romper…something even more infantile than what i have i guess. ’cause my ab self does need to feel especially little sometimes…really little. the more cozy and snuggly the ab clothes the more little and babyish i feel. I love this post. cause it describes me to a T.
I love it when daddy picks out my clothes for the day and dresses me. I am not a sissy but i do have some shorts and baby t-shirts that have pink blue and gray with bears on the sleeves and a bear on the front of the shirt as well as all over the matching shorts. I love that set and daddy knows it brings out the true baby in me.